You have added Sequin Flowy Trapeze Cream Dress into shopping cart. FINAL SALE. This flowy cream trapeze dress can be dressed up or dressed down effortlessly. The Sequin Flowy Trapeze Dress is fully lined and made of chiffon. 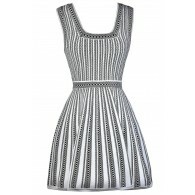 It has a rounded neckline and a loose trapeze cut. The top part of this dress is made of a textured fabric with miniature sequins throughout it. The back of this dress has a keyhole button closure, completing this look. The Sequin Flowy Trapeze Blush Pink Dress looks nice dressed up with pumps for a classy look. It also looks great dressed down with gladiator sandals for a more laid-back style. Try wrapping a fabric sash around the waist to create a fitted look. Details: Fully lined. 100% polyester. Lining: 100% polyester. Contrast: 100% polyester. Dry clean only. Small measurements: Length from top of shoulder to hemline: 33". You have added Sequin Flowy Trapeze Cream Dress into Wishlist. 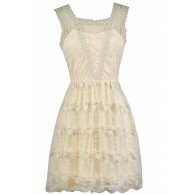 You have added Sequin Flowy Trapeze Cream Dress for Stock Notification. You have set Sequin Flowy Trapeze Cream Dress as a loved product. You have removed Sequin Flowy Trapeze Cream Dress as a loved product.